Bold-faced lies don’t fly with Feminists for Life (or most people!). An Ohio chain of clinics that want women to feel good about terminating their pregnancies up to 21 weeks has a new campaign. 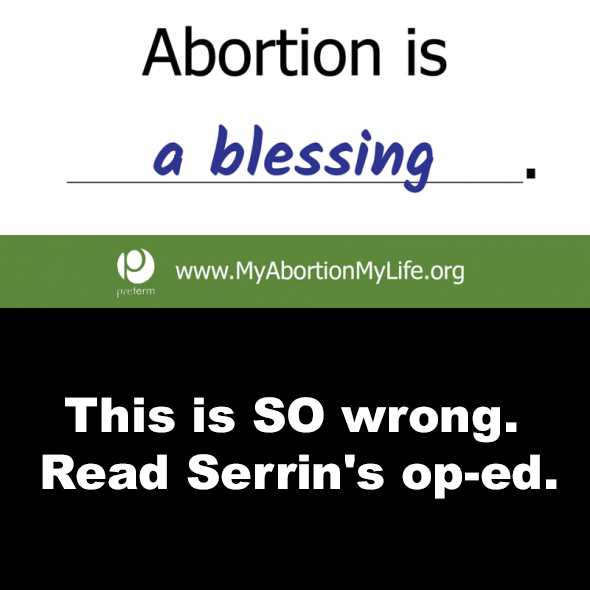 Among 16 billboards, each has the phrase, “Abortion is ________,” but each with a different word or phrase filling in the blank, like “Abortion is necessary,” “a second chance,” “gender equality,” and “a blessing.” FFL President Serrin Foster sounds off in her latest opinion editorial, “Abortion Is Never ‘a Blessing” or a ‘Second Chance‘” in The Christian Post. Preterm, the largest abortion clinic in the state of Ohio, has 16 billboards across Greater Cleveland and a new marketing strategy to make women feel better about their abortions up to 21 weeks. Women should never be made to feel that abortion “is necessary.” Instead, women need to know that there are pregnancy resource centers with perfect strangers ready and able to assist. Since half of abortions are repeat abortions (many having more than one), apparently abortion solves nothing. After an abortion, she goes back to the same unsupportive partner (or not), workplace or school, and society that made her feel like her child would be inconvenient to them. We know from the Guttmacher Institute, the former research arm of Planned Parenthood, who are at highest risk: Three out of four are the poorest among us. Abortion doesn’t enrich their lives. Most are women of color (61%). Their children are as precious as anyone else’s. Fifty-nine percent are already mothers.They know it’s more than just a “blob of tissue.” (Aren’t we all.) So abortion providers are making adjustments to overcome concerns of distraught women reconsidering their abortion before they walk out of their clinic. During my study of the internal training documents of Planned Parenthood, revealed in “Manipulation,” the Fall/Winter 2016 issue of Feminists for Life’s magazine,The American Feminist, we see this new effort in the abortion industry to “normalize abortion” as a “life event similar to having a baby, getting married or divorced, or losing a loved one.” You see that strategy in these Preterm billboards. Cancer is normal, too, but we don’t want everyone to experience that. Preterm states that they aim to “shift the public conversation on abortion away from the black-and-white political rhetoric.” We do, too. Abortion is a reflection that we have not met the needs of women. We want women who have experienced reproductive grief from an abortion to find real help from professional grief counselors so that they never return to Preterm or another abortion provider ever again. But first and foremost, we want women to get help they need and deserve before they ever feel driven to that first abortion. Susan B. Anthony, whose birthday we celebrate on February 15, urged the movement to address the root causes that drove women to abortion. As Feminists for Life, instead of normalizing abortion, we seek to normalize the resources that women need and deserve by moderating FFL Pregnancy Resource ForumsSM on campus and developing a new online resource, WomenDeserveBetter.com. As we approach the Centennial Celebration of the 19th Amendment in 2020, let’s follow in the footsteps of our feminist foremothers and redirect our efforts to address three major unmet needs of women: lack of education, lack of accommodations in the workplace and school, and lack of paternal support. Our feminist foremothers knew that abortion isn’t the answer because they considered children a blessing. Feminists for Life is a nonpartisan, nonsectarian organization that welcomes all who share our belief that women deserve better and every human being from the moment of creation should be cherished. To inquire about bringing an FFL speaker to your campus, contact info@feministsforlife.org. Media inquiries should be directed to info@feministsforlife.org.